Your day-by-day itinerary now includes St. John's Anglican Cathedral as well as City Botanic Gardens. Deepen your sense of the past at sights like Chenrezig Institute and Catholic Old St. Stephen's Church (chapel). Museum-lovers will get to explore Queensland Museum & Sciencentre and Queensland Air Museum. Get out of town with these interesting Brisbane side-trips: Caloundra Lighthouses (in Kings Beach), Caloundra Regional Art Gallery (in Caloundra) and Atrium Gallery at Buderim Craft Cottage (in Buderim). There's still lots to do: identify plant and animal life at Lone Pine Koala Sanctuary, explore the historical opulence of Sunshine Castle, contemplate the long history of Boggo Road Gaol, and pause for some serene contemplation at Albert Street Uniting Church. For photos, reviews, other places to visit, and other tourist information, you can read our Brisbane road trip tool . Algiers, Algeria to Brisbane is an approximately 28-hour flight. The time zone difference when traveling from Algiers to Brisbane is 9 hours. When traveling from Algiers in March, plan for somewhat warmer days and much hotter nights in Brisbane: temperatures range from 32°C by day to 23°C at night. Finish your sightseeing early on the 20th (Wed) to allow enough time to drive to Gold Coast. Do some cultural sightseeing at Tweed Regional Gallery & Margaret Olley Art Centre and Ripley's Believe It Or Not! Surfers Paradise. Step out of the city life by going to Surfers Paradise Beach and Burleigh Heads Beach. Explore Gold Coast's surroundings by going to Tamborine Mountain (Castle Glen Cellars & Tamborine Mountain Glow Worm Caves) and Cape Byron Lighthouse (in Byron Bay). The adventure continues: look for all kinds of wild species at David Fleay Wildlife Park, find something for the whole family at Warner Bros. Movie World, head outdoors with Pelican Feeding, and take in panoramic vistas at SkyPoint Observation Deck. You can drive from Brisbane to Gold Coast in an hour. Other options are to take a bus; or take a train. 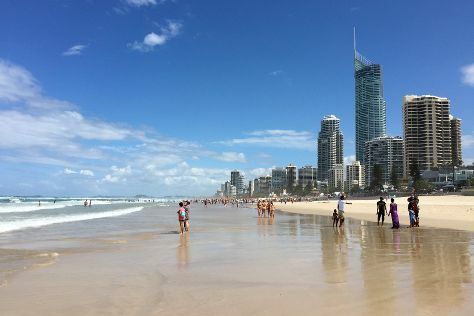 In March in Gold Coast, expect temperatures between 32°C during the day and 23°C at night. Cap off your sightseeing on the 25th (Mon) early enough to travel to Sydney. You've now added Sydney Adventure Tours - Frontier Photographic Safaris to your itinerary. Museum-lovers will get to explore Australian National Maritime Museum and Hyde Park Barracks Museum. Take a break from the city and head to Bondi Beach and North Head Sanctuary. Get out of town with these interesting Sydney side-trips: Coachwood Glen Nature Trail (in Megalong Valley), Pulpit Rock Lookout (in Blue Mountains National Park) and Norman Lindsay Gallery & Museum (in Faulconbridge). And it doesn't end there: take a stroll through The Rocks, admire the masterpieces at White Rabbit Gallery, take in nature's colorful creations at Royal Botanic Garden Sydney, and enjoy the sand and surf at Manly Beach. To see where to stay, photos, other places to visit, and more tourist information, you can read our Sydney journey planner . You can fly from Gold Coast to Sydney in 3.5 hours. Other options are to do a combination of train and flight; or drive. In March in Sydney, expect temperatures between 30°C during the day and 22°C at night. Wrap up your sightseeing by early afternoon on the 3rd (Wed) to allow enough time to travel back home.